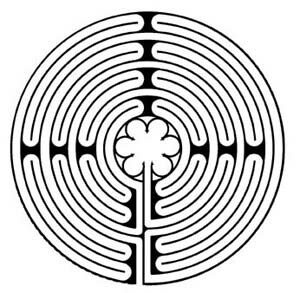 The labyrinth is a tool to use in contemplative prayer and meditation. Labyrinths are often confused with mazes. But while a maze has dead ends and blind alleys, the labyrinth has only one path leading both in and out of the center. The labyrinth is flat. One can always see the center. The destination is assured, so that the mind can be still and attentive to God. Walking the labyrinth clears the mind and gives us insight into our spiritual journeys. The labyrinth does nothing on its own. It is simply a tool helpful for many people in deepening their prayer lives. Each walk into and out of the labyrinth is a unique opportunity to meet our creative, loving God through contemplative prayer. The labyrinth design is the labyrinth pattern built into the floor of Chartres Cathedral in France in the 1200-1300's and is the best known Christian labyrinth design in the world. The 36 foot or the 24 foot canvas labyrinth are now available for use in churches and retreat settings throughout our annual conference. The large labyrinth, centrally housed at the AWFUMC conference office, may be used by any United Methodist Church of the conference for up to two weeks at one time. It can be easily transported in the trunk of a car. The labyrinth is for indoor use only. Included are instructions for use and care. We ask that no food or beverage of any kind be used on the labyrinth as it is costly to clean when soiled! It is to be used on a freshly swept /vacuumed surface. We respectfully request that anyone who reserves one of the labyrinths pay a $25.00 fee. Please make a check out to the AWFUMC Labyrinth (this includes all Spiritual Directors, clergy, laity, etc.) to assist with ongoing cleaning and maintenance of the labyrinth(s). You will be expected to arrange for labyrinth (large) transport to and from the AWFUMC Conference office or the (small) labyrinth to Donell Seager, during office hours. Click here to view and download the guidelines. Click here for a downloadable flyer on "What Is A Labyrinth". For details about what a labyrinth is as well as pictures, click here for an online video.